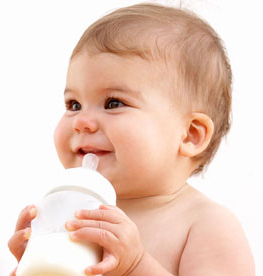 If you must give the baby a bottle as a comfort at bedtime, it should contain only water. If your child won’t fall asleep without the bottle and its usual beverage, gradually dilute the bottle’s contents with water over a period of two to three weeks, progressing to strictly water in the bottle. After each feed, wipe your child’s gums with a clean, damp gauze pad or washcloth. You should start brushing your child’s teeth as soon as the first teeth come in. Gently brush with a child-sized toothbrush and water. Rinsing the mouth is an option you can try with older children. Fluoridated toothpaste can be used safely when you are sure that your child spits out all of the toothpaste after brushing. Older children can use a toothbrush with soft, nylon bristles. Use a very small amount of toothpaste (no more than the size of a pea). (You should consult the child’s dentist before considering using fluoride toothpaste). Always be sure your baby’s pacifier is clean. Don’t ever dip it in anything (such as sugar or honey). Don’t clean your baby’s pacifier by sucking on it yourself, a common but unhealthy practice, since you are passing bacteria from your mouth over to your baby! Inspect your baby’s teeth frequently and have them checked by your child’s doctor or a dentist. Join our next blog to learn if breast fed babies are at risk for early childhood decay! This entry was posted in Cavity Fighting Strategies, Oral Health and Overall Health, Oral Hygiene, Other Tips, Prevention and tagged baby bottle caries, baby bottle tooth decay, how to prevent baby bottle tooth decay. Bookmark the permalink.